Bluefly is one of the first sites to offer members-only shopping of important brands via limited time sale events. The user-friendly site offers lots of products as well as fashion tips and news. Popular designers include Gucci, Michael Koors, Christian Louboutin, Prada, Fendi, and more. For the serious discount digger, 6pm offers brand names at great discount with a savings of up to 75% off. The site is designed like a virtual outlet mall, with some deals that are time-sensitive and some that are ongoing. This site has every brand in the alphabet, from Adidas to Zac Posen. Beyond the Rack is a members-only site for men and women who shop designer brands and accessories of all kinds. When you sign up, Beyond the Rack provides discounted designer merchandise via sales that typically last for 48 hours and can result in up to 80% savings. Members are notified by email in advance of each upcoming event according to their member profile. Like Beyond the Rack, Editors' Closet is a private sale website that offers exclusive, limited-time savings on fashion and luxury brands for men, women, and children. Editors' Closet also offers free and same day shipping, authenticity guarantees, and (according to them) the lowest prices around. Dig Calvin Klein, Roberto Cavalli and Michael Kors? Editors' Closet gets you the most popular luxury designers at prices you can't beat. A storefront and a website, Loehmann's has a huge inventory of designer brands like Roberto Cavalli, Dolce & Gabbana, Tom Ford, Oscar De La Renta, and so much more. Get big discounts anytime at Loehmann's, and if you buy more than $50 worth of goods, shipping is free. Fashionesta is an online outlet store for exclusive deals from the world's top designers. Get Armani, Christian Dior, Burberry, Cavalli, and more anytime, as long as you sign up to be a member. Founded by Amazon.com, MyHabit is a private fashion sale site for men, women, and children offering up to 60% off selections of designer and boutique brands. Use your Amazon membership for access to Versace, Diesel, and Valentino. But be sure to read the fine print — some sales are indefinite, but some have strict time limits! Vente-Privee offers sales on premium brands to members. Become a member, log on every morning, and Vente-Privee provides a host of sales on all kinds of luxury labels like Saint Honore and Prada. Gilt boasts 60% off brands and services for women, men, and kids, plus home decor/design. Along with clothes and home goods, Gilt boasts exclusive local services and experiences. Become a member and get access to time-sensitive sales on just about everything! At My Clothing Favors, shop brands like Ed Hardy, Abercrombie, Affliction, Ralph Lauren, and Burberry at cheap wholesale prices. The sales are ongoing, with lots to choose from. Get 50%–75% off designer brands at HauteLook, with daily-time sensitive deals for all! HauteLook specializes in boutique designer brands like Ella Moss, Philosophy, and Missoni, but has a lot of variety as well as a blog, makeup tips, and accessory help. An original online discount retailer, Overstock.com has everything you need. From bedding to sunglasses to cars to art to furniture, Overstock has some major brands like Prada, Michael Koors, and Gucci but also has non-branded discounted merchandise, as well. Marketed as a "personal online shopping assistant," Shop It To Me knows how to tailor good deals to every member. Make personal shopping feeds based on in-depth questionnaires, and let the site scour online retailers for the best deals on favorites for you, your body, and your aesthetic. Brands include Black Halo, Diane Von Furstenberg, Tory Burch, and DKNY…to name just a few. Shop411 is an online search engine that will find and list the savings of other discount sites. Shop by category, department, or brand, and Shop411 will have what you're looking for…or it'll go out and find it! Label Shopper hunts for discount brand name items that have been over-ordered or returned by manufacturers, turning ordering mistakes into money-saving opportunities! Ongoing deals on brand-name and brand-name-quality items keep you in the best duds though be warned — this site has serious deals but often can't reveal the brand of the item you're buying until you've bought it! 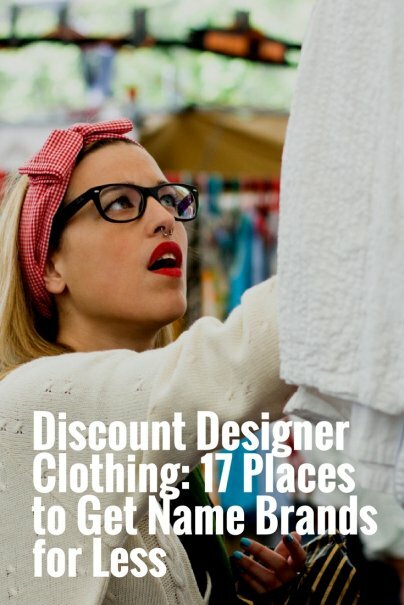 What's your favorite online source of discount fashion? ShopMieux is one of my favorite places to buy clothes from! They have so many brands for affordable prices! They also have great customer service and are happy to answer any of your questions. Many of the links that have been provided, no longer work. (Beyond theRack, Editor's Choice, to name a few.) Net LA Mode offers up only one thing at a time ie... today was cold weather coats. Blue Fly, Net Porter and My Habit are great!!! I was going to buy a pair of Sam Eldeman sandals from Amazon for $130... I found them at Net-a-Porter for $70.!!! !thank you!